A Sayre native from a well-known family, James R. Nobles, Jim to everyone has been one of Sayre's foremost historians and, at the same time, one of its greatest fans. Jim continues a tradition in his family of service to one's community. The Founder of the Sayre Historical Society, Jim became its first president, filling that post for nearly five years. He also was editor of its then newly published magazine, the Sayre Quarterly. Jim has authored many articles in the Sayre Quarterly over the years to promote public awareness of Sayre history. Most notable during the centennial year was the compilation of the history of Sayre from its beginnings as a vision of Howard Elmer and its incorporation as a borough through all the progress in the community through the century. Jim served as the managing editor of A Century of Memories, Sayre, Pennsylvania 1891-1991, the 128-page hard cover book detailing that history that was published in 1991 and became a sold-out success. He was the author of Engine Company No. 1 of the Sayre Fire Department. Jim served as editor of Repeating Myself, a compilation of local history memories of Ruth Dyer Tozer Bixby, a well-known Valley teacher. Most recently, Jim was instrumental in publishing the society's postcard history book, through the series from Arcadia Publishing Company, titled Sayre in which he did all he writing and oversaw its success. Jim graduated from Sayre Area High School and then from Mansfield University after which he returned to teach social studies at his Alma Mater for 35 years, retiring in 1997. Jim was one of the more active faculty members, participating in many activities with the student body and the high school faculty and in various capacities for the school district, among them two separate tenures as Chair of the Social Studies Department. 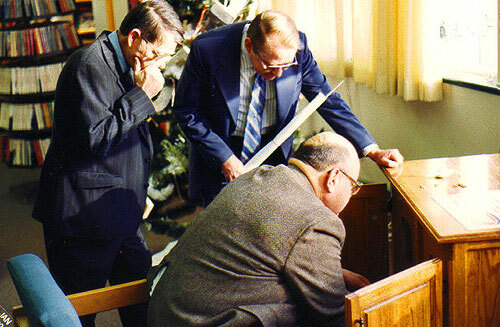 He served for 14 years from its second year in 1983 until his retirement as Curator for the Sayre School District Archives, known then as the Centennial Library established from the Sayre schools centennial of 1982. Under his tenure, the collection grew considerably; many of its artifacts of school history, some corresponding with the current school events, were placed on display for the enlightenment and pride of the school community and the public. 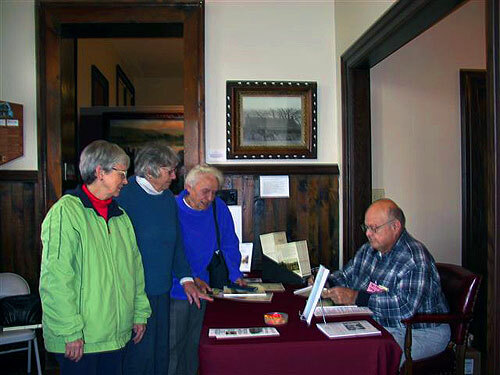 Jim Nobles signs the Sayre postcard book which he produced. Waiting for their copies are Corinne "Corky" Meikle, longtime society member and supporter and Beryl Cleary, former society board member. Copies can be purchased at the Burkhart Gift Shop in the museum. He was named as the yearbook dedicatee three times: 1968, 1992, and 1997, the only person to achieve that distinction. He was also the recipient of the Redskin Club's Joe Powell Award for exemplary spirit and leadership. Jim served on three Boards of Directors: the Sayre Historical Society, the Bradford County Historical Society and the North-Central Pennsylvania Branch of the American Heart Association. He has been a member of the Church of the Redeemer, having served on the Vestry plus numerous church committees. 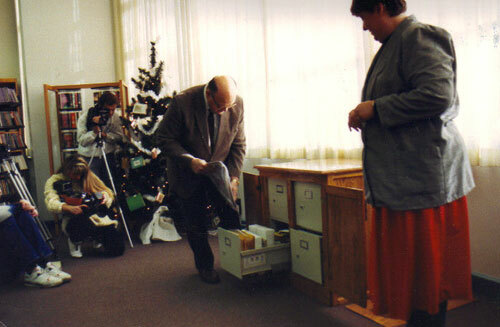 Jim with Mary Lou Palmer, Mistress of Ceremonies and an original member of the historical society and a former Board Member, at the Time Capsule ceremony held in the Sayre Public Library in 1991. The Time Capsule has been relocated to the Sayre Historical Society Museum. Jim has shown his interest in his community through his involvement in different organizations. He is a member of the Rural Amity Lodge No.70, F. & A.M. and other Masonic bodies. He had been an active member of Engine Company No. 1 of the Sayre Fire Department where he served as a cover-up driver for the aerial ladder fire truck. He had been a part-time officer of the Sayre Police Department for over 20 years and spent over 10 years with the Valley Ambulance Corps. He was an authorized First Aid instructor for the local branch of the American Red Cross. He has participated in local elections helping candidates with their campaign organization. Jim has shown his love of history extends beyond his local area. He has visited scores of historical sites and museums not only in the United States but also in Europe to acquire ideas and knowledge to assist in the development of his hometown museum. Jim serves as an officer in the Pvt. Silas Gore Camp No. 141 of Bradford County, Sons of Unions Veterans of the Civil War, an organization for preserving the memory of the Grand Army of the Republic and the ancestors who fought to preserve the Union 1861-1865. In 1992 Jim received the Leo E. Wilt Historian of the Year Award presented by the Bradford County Historical Society in recognition of his commitment to the preservation of local history through his efforts as an organizer of the Sayre Historical Society and the Centennial Committee. It is in that capacity that he is held in such on-going high regard his love and knowledge of history in general and of local history in particular and his desire and unselfishness to share his knowledge with others. From the beginning, Jim has served the Sayre Historical Society with distinction, especially in his many efforts first to establish, and later to develop and promote the Sayre Historical Society Museum - the museum of all of Sayre. In December 2005, a memorial brick was placed in the front plaza at the Sayre Theatre to honor him as Founder of the Sayre Historical Society. 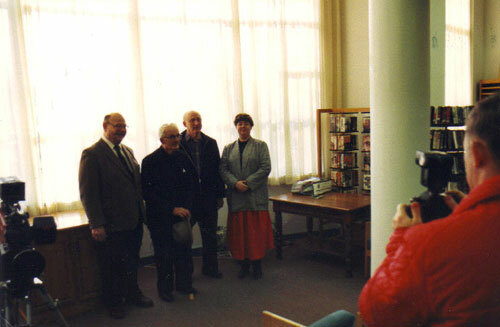 In December 2010, the Society honored Jim again by designating the library on the second floor of the museum as the Jim Nobles Library. 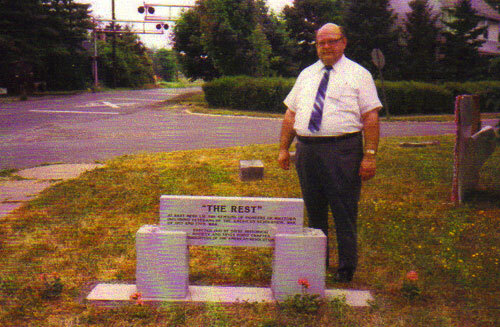 Jim Nobles at the dedication of the monument stone for the Rest Cemetery during Sayre Borough's centennial year, 1991.